The concept of Net-Zero Energy homes appears to be moving forward toward main stream. California is leading the nation with a goal of having all new homes constructed by 2020 achieving net-zero under its Residential ZNE Plan. Builders and homeowners in other areas around the country appear to be embracing the concept of homes that consume no more energy than they generate. A Net-Zero Energy Home is one that nets to zero for its energy consumption. A Home Energy Rating System HERS score of zero, certified by a Residential Energy Services Network RESNET inspection, is the standard for confirmation. 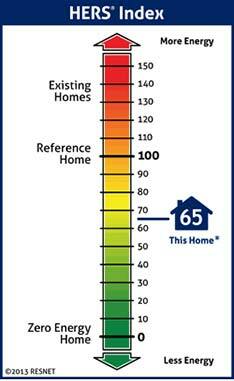 The U.S. Department of Energy estimates that the typical older exiting home will have a HERS score of 130. So, well above zero. Technically, any dwelling can achieve net zero if enough alternative energy is used. To achieve net-zero, a home will have some type of sustainable energy source, typically solar, allowing it to generate as much power as it consumes thus netting zero energy. However, the cost of generating enough alternative power to match the energy consumed by a home with poor energy efficiency quickly becomes cost prohibitive. First and foremost, a Net-Zero home must be highly energy efficient. A key component to increased energy efficiency in homes is better insulation. It’s also one of the most cost effective methods to making net-zero homes more affordable. Residential architects and builders working toward net-zero homes are taking a holistic approach to energy efficiency in the design, construction and building product specifications. This includes designing tighter homes with more insulation. Those with a green eye focused on the environment, as well as energy savings, are specifying Eco-friendly recycled products like cellulose insulation in their plans for net-zero energy homes. Buyers considering a newly constructed home should ask builders to provide a HERS score rating specifically for the home they intend to buy or build. Homes with a lower score may be a better buy in the long run since the energy savings, particularly for net-zero homes, can add up to thousands of dollars over time. Owners of older homes can take steps, such as retrofitting to improve insulation, to lower their HERS score and save as well. Find out more on retrofitting with cellulose insulation and contact RESNET Qualified Home Energy Professional to get a HERS score rating. This entry was posted in Alternative Energy, Energy Savings, Green Building. Bookmark the permalink.